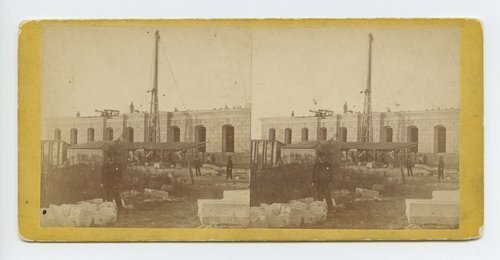 This stereograph shows the Kansas State Capitol building under construction in Topeka, Shawnee County, Kansas, in 1867. The photograph shows scaffolding, workers, building stone, and a portion of the completed first floor. The stereograph is from Alexander Gardner's series, "Across the Continent on the Union Pacific Railway, Eastern Division," and includes the notation "351 miles west of St. Louis Mo."